Soccer-Themed Advertising Misses the Mark with American Viewers. The 2018 FIFA World Cup has come to an end. Congratulations France! Although the US team did not make it to Russia for the games, Fox Sports says ad revenue for the World Cup was a success. It seems brands and marketers did not want to miss out on the once-in-every-four-years opportunity to reach the World Cup’s global audience, and the engaged Hispanic market in the US. Now that the games are over you can expect a lot less soccer on your screens, and probably a surge in Back-to-School advertising. But before that happens, we wanted to share our analysis of 2018 FIFA World Cup ads (according to US viewers). The World Cup was the third largest sporting event in 2018 thus far, following both Super Bowl 52 and the Pyeongchang Winter Games. Even though soccer is an internationally-adored sport, it hasn’t gained quite the same traction here in the states. Overall ad effectiveness, represented by the Ace Score, for this year’s World Cup ads trailed significantly behind both Olympics and Super Bowl creatives. Average Attention & Likeability scores were not looking as great either. 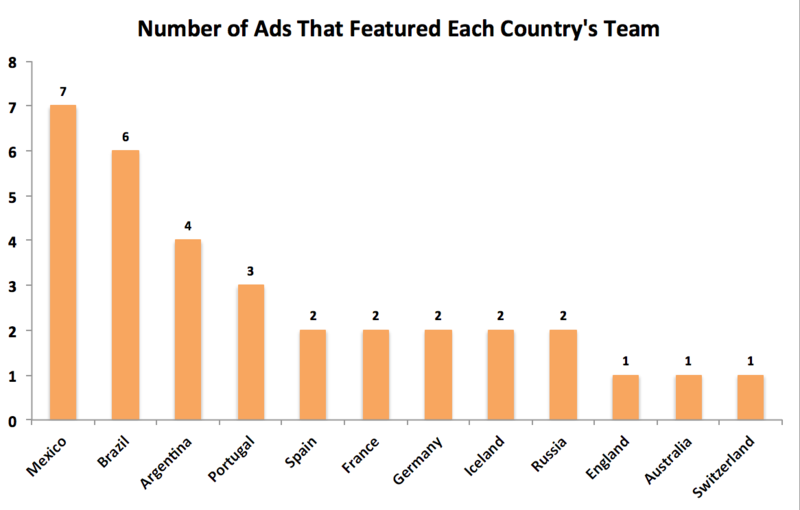 Additionally, World Cup ads were the most polarizing among the three events due to soccer’s limited appeal among US viewers. 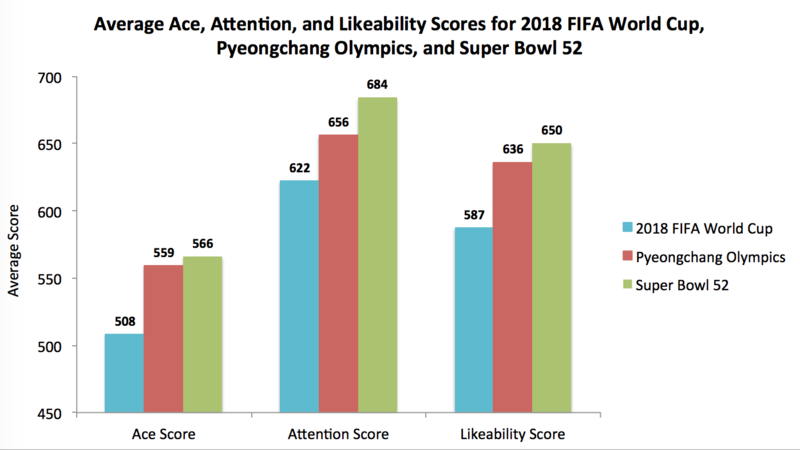 While averages did not measure up to Pyeongchang Winter Games or Super Bowl 52, some ads achieved strong scores in Attention and Likeability and are worth recognizing. The following ads successfully broke through all the soccer clutter in a Likeable manner. While most of the ads had an obvious connection to the World Cup, the combined word cloud of verbatim comments for the top Breakthrough ads suggests negative reception to the presence of soccer in these ads. There were several creative elements working together in Coca-Cola’s “Get Ready for the #FIFA World Cup,” including music from AC/DC, but the Product Itself came out on top as the Single Best Thing. As a result, Coca-Cola received the strongest Desire score and top two box purchase intent among the top ten. One ad from Wish’s “Time on Your Hands” campaign made it in the top ten. In the :15 second spot, Italian footballer, Gianluigi Buffon, humorously whips up a cake replica of Tim Howard. However, the overall Likeability did not stem from the subtle soccer tie-in. As a matter of fact, only three viewers mentioned “soccer” or “Gigi Buffon” in their comments. The rest of the verbatims reveal the combination of Buffon’s playfulness in the kitchen and the upbeat, catchy music drove Attention and Likeability. Luckily for Wish, “Shop Here” will have success beyond the World Cup stage. The Music in Qatar Airway’s “Dancing in the Street” was named the Single Best Thing about the ad, and was mentioned in 15% of verbatim comments. For the most part, the song choice was positively received and Attention-grabbing. However, the singer, Nicole Scherzinger, resonated more with female viewers than males, as reflected in the difference in their scores. Of all the ads in the top ten, Adidas’s “Creativity” resonated the best with viewers who were “very” or “somewhat interested in professional soccer.” The visuals were key creative drivers in the ads from Gatorade, Geico, and EA Sports. Hispanic viewers enjoyed Geico’s dramatization of a goal celebration the most — 56% of them responded as “very likely” to share with their social circles. And with that, we blow the final whistle on 2018 FIFA World Cup advertising. Who Earned an A+ in Back-To-School Advertising?